winning is the opposite of soul losing! winning is winning the lost over to Christ and letting Him save their souls! the unsaved to Christ is just that, leading them to the One Who can save their souls! soul winning – TESTAMENT & TESTIMONY! are getting closer to the one who will say yes to Jesus! 14. Think of each unsaved one as a loved one! 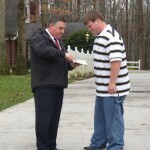 bypass anyone on soul winning night!